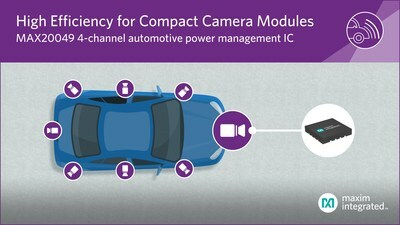 SAN JOSE, Calif., March 25, 2019 /PRNewswire/ -- With automotive camera modules becoming increasingly smaller, designers can now utilize the ultra-compact MAX20049 power management IC from Maxim Integrated Products, Inc. (NASDAQ:MXIM), which integrates four power supplies into a tiny footprint. In addition to being the most compact power management IC for vehicle camera modules, it delivers the highest efficiency on the market today. The MAX20049 offers many options to support various output voltages, while also providing fault mitigation by flagging faults and shifts in output voltages. "We continuously look for integrated power devices that provide the required power source for image sensors while minimizing size in vehicle-based imaging designs," said Tsutomu Haruta, deputy senior general manager, Sony Semiconductor Solutions Corporation. "Maxim's power solutions would help enable multi-camera functionality and advanced driver safety systems in a small footprint." "We selected the MAX20049 due to its high integration, which aids in designing smaller boards – traditionally a challenge in designing cameras," said Chris Day, vice president of Marketing, Ambarella. "Maxim has a stellar reputation within our Tier 1 customers for providing a complete automotive-grade solution for power and SerDes that include AECQ100 and ASIL-level certifications. Using reputable automotive-grade parts in our reference design ensures that customers can simply replicate the design, thereby reducing the overall risk in production." "Designers have increasingly demanding constraints to adhere to when designing for the tiny components that go into cars, such as cameras modules, which is why there is a growing demand for more advanced power management ICs," said Chintan Parikh, executive business manager for the Automotive Business Unit at Maxim Integrated. "The MAX20049 meets ADAS design needs in terms of form factor, fault mitigation and power requirements, which translates to faster design cycles and quicker time to market."